Sania Mirza is had a disappointing outing at the Pilot Pen tennis tournament at New Haven, USA. She lost to Ukrainian Alona Bondarenko in the second round 3-6, 6-0, 3-6. 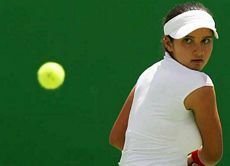 Sania and her Italian partner Mara Santagelo won their doubles match to advance to quarterfinals in women's doubles after defeating American Corina Morariu and Meghann Shaughnessy 6-4, 7-5.